China Men’s Clothing Industry Development Report showings Men’s Clothing industry development and perception of market trends. 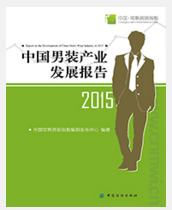 China Men 's Clothing Industry Development Report is published by China Textile & Apparel Press. China Men 's Clothing Industry Development Report published in May 2015, published in May each year, Priced at 800 USD per copy (Not including postage), limited number of it, welcome to subscribe. China Men’s Clothing Industry Development Report is based on the China National Textile & Apparel Council and market research to obtain first - hand data. It is showing the men’s Clothing production data, retail data, electricity business data, and import and export data. Furthermore, It use these date to sorting and mining, analysis of the development of men 's Clothing industry and Trends, while explaining the hot topic of related industries in recent years. Hence, the readers will have a comprehensive understanding system of the men's industry. China Men 's Clothing Industry Development Report main readers: clothing and related business decision-makers, senior management; governments; clothing professional market; all levels of textile, clothing industry associations; University library and so on.